Take the opportunity today to give someone your undivided attention for as long as they need it. We all want to be heard, it’s part of our social DNA. We are pack creatures and good communication is vital to our very survival. But these days it seems that listening and hearing are two different things. Have you ever had a conversation with someone and you just know that they are just waiting for their turn to speak? Not too satisfying is it? Next time you’re in a conversation be aware if you are actually listening or just waiting for the chance for you to speak. The simplest way to give your undivided attention is to not think about saying anything. Just listen, and when it naturally becomes your turn – if you’re asked for your opinion for instance, then ask something relevant to what you’ve just heard which will allow the other to continue explaining. When this becomes a habit you’ll not only get a lot more out of your conversations, because you will have really understood the other’s point of view, but you’ll find that other people, through the law of reciprocation, will listen more intently to you. This leads to deeper communication, increased levels of empathy and understanding and better relationships all round. PS: Buy yourself OR someone else a copy of my book right here on Amazon: http://amzn.to/1ahfW7R (you’ll see my listing right at the top – it’s the cheapest place to get copies at the moment and YES they’re brand new AND signed). 36 GOLD Star reviews so far! Take the opportunity today to be non-judgemental. Now that’s a hard one! Hmm, where to start? I suppose the easiest way to have a go at this is to first be judgemental. Then, after your initial thoughts about something or someone give yourself the opportunity to look at it from a different angle. Our present belief systems are so ingrained it would be almost impossible to just stop being judgemental, so allow it. Accept it. Then question it. Then you might find yourself being judgemental about your judgementalism. As I said – it’s a hard one, but have a go anyway. PS: You’re always welcome to buy yourself OR someone else a copy of my book right here on Amazon: http://amzn.to/1ahfW7R (you’ll see my listing right at the top – it’s the cheapest place to get copies at the moment and YES they’re brand new AND signed). Take the opportunity today to turn the other cheek. This blog will feature a page from my book each day from now on. Our ego more often than not rules a large part of our conscious lives. It gets us in to a lot of trouble. It’s constantly on the look out for con- firmation of our paradigms and belief systems. This can manifest in many ways, most are harmless, but some can be very confrontational. Imagine you’re a gang member in a ghetto somewhere and somebody you don’t know looks at you from across the street for a second or two. It could be because they think they know you, or they like your T-shirt, or they’re thinking of asking you for directions. You may interpret that gaze as an afront. You may think it’s a gesture of disrespect. Your ego kicks in and whispers in your inner ear ‘That guy is trying to intimidate me, right in my own neighbourhood.’ That thought may lead on to you strutting across the street to confront the guy, and so on etc. We know how that’s going to end. Well that’s an extreme example I know, but now think how you may be doing that from time to time in a much subtler way. Screaming at someone who just cut you up on the road, or giving someone a dirty look because they bumped into you on the street without say ing exceuse me, or becoming annoyed that ‘someone’ used the last of the milk and now there’s none left for you to have a cup of tea. Next time something like that happens, just turn the other cheek. Forgive them. Let it go. Maybe the car driver is trying desperately to get to hospital – no excuse I know but if it were you, you might be rushing a bit right? Maybe the person that bumped into you was so focused on the upset of just being fired they didn’t notice the collision. Maybe, the last of the milk is being replaced right at that second – you can wait two minutes can’t you? 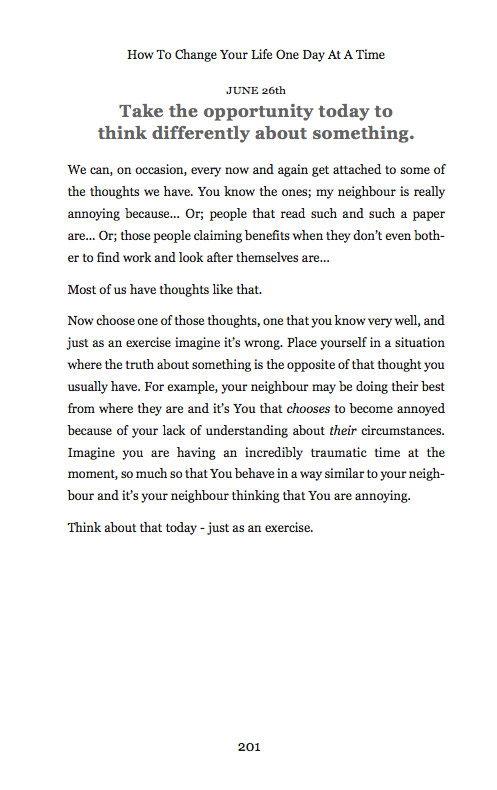 It takes a bit of practise but try it next time one of those thoughts comes into your mind. And remember; your ego can be your worst side as well as your best side. Give the best side more exposure to the outside world. Can this be done by someone else ie: delegated? Where might this decision lead? Now that you have decided to move forwards, whether that’s getting a new job, a new career, or starting your own business, you need to think a little deeper. Some of these may seem obvious, but when you are in an emotional state sometimes the obvious is hidden. Following on from my previous blog post What’s the cost of staying in your job? as promised in this post I will discuss how to make that BIG decision. 3. Is what you want worth risking everything you already have? 4. What to do next? In order to gain functionality I’m moving this blog over to a self hosted WordPress platform. From there I will continue where I left off here – discussing changing jobs. Everything will remain the same except I should be able to provide a better service, more offers of free daily content (see my ‘Ponders‘ offer there right now), and an easy way to interact with me directly. I’ll continue putting some reminder posts on here for the time being and hope this doesn’t cause too much inconvenience.